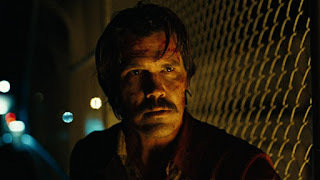 A fascinatingly morose drama set in rural Texas, No Country For Old Men delves into the decaying soul of society through the fragmented story of a drug deal gone really, really bad near the Mexican border. With a chase for a bagful of cash animating what remains of burnt out emotions, absolutely nothing matters except the grim reality of random unpredictability. 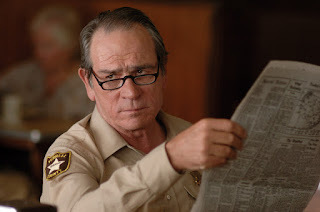 Ed Tom Bell (Tommy Lee Jones) is a third generation county sheriff in rural Texas. Aging and emotionally exhausted, Ed Tom has seen it all, and realizes that the worst is yet to come. With assassin Anton Chigurh (Javier Bardem) roaming the countryside, killing at will, Llewelyn Moss (Josh Brolin), a local welder and hunter, stumbles upon a gruesome scene in the desert: five pick-up trucks riddled with bullets, more than a dozen dead Mexicans, a massive stash of unclaimed drugs, and a large amount of cash in a small case. Llewelyn takes the cash, which immediately makes him a target for Anton's clients. Anton is a dispassionate killing machine who has reduced the vagaries of life to a coin toss. He dispatches his clients and goes after the money himself, using a transponder hidden in the bag to track down Llewelyn, who is now fully on the run. Ed Tom finds himself with a mounting body count and hopelessly out of his depth in dealing with the escalating carnage, which is about to get a lot worse when Carson Wells (Woody Harrelson), another gun for hire, enters the fray. 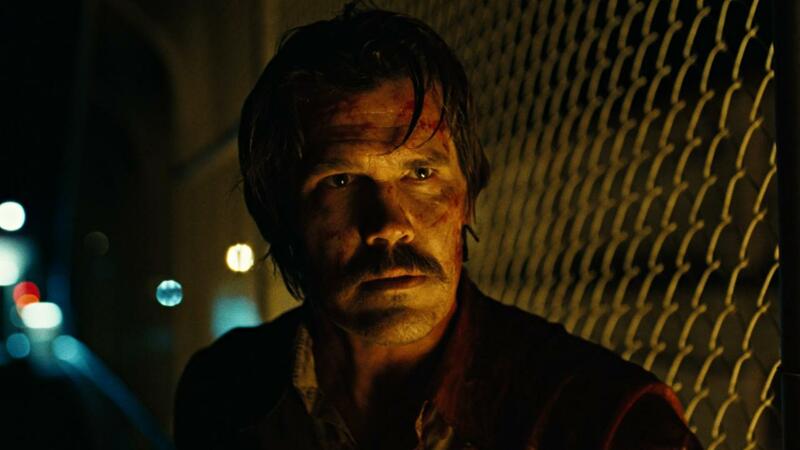 Directed by Joel and Ethan Coen, No Country For Old Men is a spiritual companion piece to Fargo. But this time around, as evil spreads through the land, local enforcement in the shape of Ed Tom is exhausted, pessimistic and keenly aware how futile his efforts are. The film adapts the Cormac McCarthy novel with an unsettling matter-of-factness: horrible things are happening and will continue to happen, and there is not much that any one person can do. Filmed with a love for open landscapes, an appreciation for the enormity of rural Texas, and all the places where men can decide to embrace darkness, No Country For Old Men discards any typical Hollywood expectations of heroism, righteousness prevailing, or happiness somehow making its way into the story. Ed Tom is the only character who would care about any of these things, and he is long past caring. Almost every other character in the film is either seduced or obsessed by money, power, greed or death. The territory is filled with opportunities for villainy, and men like Anton, Llewelyn, Carson and their financiers are free to roam in search of profit most foul. They also know that they are all one wrong turn away from death, much like all the dead gangsters, their dead dogs and bullet-riddled pick-up trucks in the desert. And even thinking of good deeds is a bad idea. Llewelyn's troubles start when he decides to try and give a dying man his last sip of water. After setting its own boundaries, the film proceeds to test the limits of traditional cinematic rules. A couple of characters are presented with care as interesting protagonists, only to be summarily, almost shockingly, knocked-off with contemptuous disdain. The one certainty is the uncertainty of randomized fate and destiny, and the Coens challenge expectations about who deserves to live and die, and why. 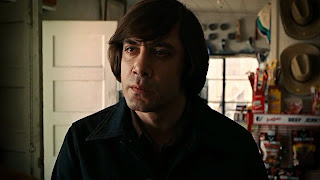 At the core of the mounting body count, the character of Anton Chigurh is one of the most intriguing hitmen to ever bloody the screen. Javier Bardem brings Anton to life with a lumbering lethality, a detached assassin carving a path of destruction across the Texas backroads. His weapon of choice is the cattle gun, a most appropriate representation of what he thinks of his fellow humans. With supposed heroes like Ed Tom recognizing their limitations and promptly yielding, the most terrifying conclusion is that the future belongs to men like Anton. No Country For Old Men is a place where anything can happen. The only real expectation is that it's all bad, and for everyone.